Every year from late summer into mid-November Walt Disney World presents the Epcot International Food and Wine Festival. In 2019, the Festival will run from August 29 through November 23–later than it has ever run before. There are two components to the festival, one available to all Epcot visitors, and another made up of a bunch of events which have limited capacity and require reservations. 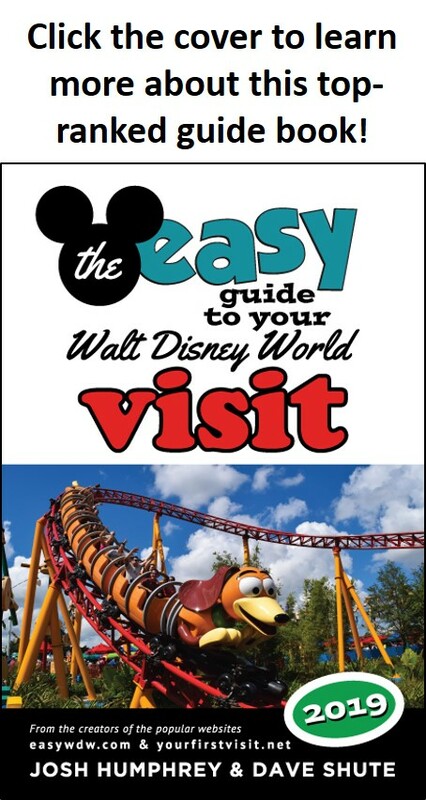 Neither has an extra ticket admission cost–you get to participate by virtue of your theme park ticket–but there are cash costs for the food, beer and wine, and for entry to some special shows and events. 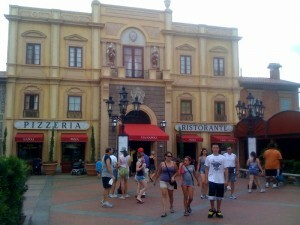 The basic program takes place in Epcot’s World Showcase area. 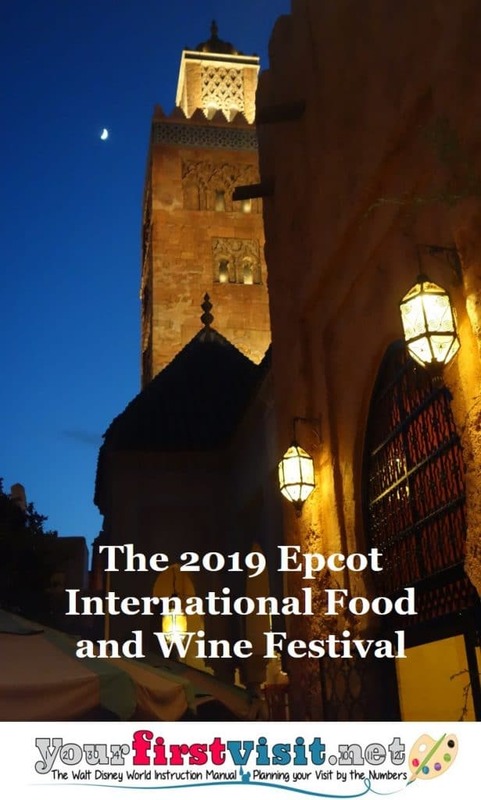 Supplementing the already rich variety of dining and snacking options in the World Showcase, the Epcot International Food and Wine Festival adds dozens of stalls highlighting the foods and drinks of various regions of the world. The food from these stalls is typically available in a snack to half-plate size. Some, but not all, can be purchased using snack credits from the Disney Dining Plan. Note that the cash price of items available as snack under the dining plan can vary by a factor of 3–don’t use a snack credit until you know that you don’t want to use it on something more expensive. 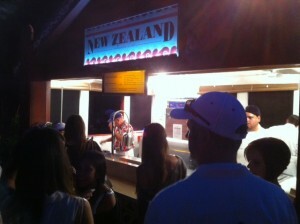 Wine and other alcoholic beverages are also available for purchase, by the glass or equivalent. Snack credits can’t be used for these! In addition, there’s a whole list of programs for which reservations are required. These will range from wine tastings, to food and wine pairings, to cheese seminars. These programs are usually announced in the summer, and the more popular sell out very quickly. See the official Walt Disney World web page for details on the Epcot International Food and Wine Festival as they emerge here. 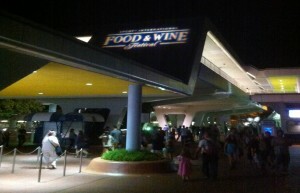 Returning adults often plan their entire trip around the Food and Wine Festival. For first-time family visitors, with 8 year olds in tow, it is a good bit less relevant. The booths and such of the festival add a bit to the pageantry of World Showcase, but in general do not increase World Showcase’s appeal to kids. Because of this, my material on when to go to Walt Disney World ignores the dates of the Epcot International Food and Wine Festival as either a positive or a negative influence.